Large 8 unit building near the intersection of Main and Walnut in the process of converting to student housing. Great strategic West Side location. Walking distance to downtown shopping, restaurants. On the bus line. Binghamton High School Pre-School, High School / Public 3 0.25 mi. West Middle School Pre-School, Middle School / Public 3 0.81 mi. Horace Mann School Elementary School / Public 3 0.37 mi. Thomas Jefferson School * Elementary School / Public 4 0.92 mi. Seton Catholic-Central High School * Middle School, High School / Private N/A 0.29 mi. 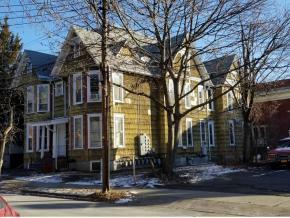 80 Walnut Street, Binghamton, NY 13905 multi-family home was sold for $150,000.